BehindMLM’s first Xerveo review went live in November of 2012. Purportedly Xerveo’s compensation had also changed significantly since 2012, prompting the need for an updated review. Today we take a look at what’s changed over at Xerveo these past few years. For reasons unknown, the “about us” page on the Xerveo website still has no information about who owns or runs the business. Why this team page isn’t linked from a page on the Xerveo website itself is unclear. spent many years in Asia developing and opening new markets prior to accepting the role of CEO. In that position, he helped grow the company from $250 million in annual sales to $850 million, which impacted countless lives in myriad positive ways. Prior to his appointment as CEO of Neways globally, Cunningham served as CEO of its Australian division for a number of years. He retired in 2005. Whereas Xerveo’s website previously had no information about their product line, today an energy drink, coffee, and nutritional products are featured. Although not listed as “products” on the Xerveo website, the company’s online store also lists a selection of artisan soaps for $11 each. The new Xerveo compensation plan ditches the matrix-based one for that of a unilevel compensation structure. Retail sales are now a strong focus, along with various performance-based bonuses on offer. There are nine affiliate ranks within the Xerveo compensation plan. An active affiliates (Master Distributor qualification) is an affiliate who generates at least $100 PV a month. PV stands for “Personal Volume” and is sales volume generated by an affiliate’s own purchase of product and retail customer orders. PTV stands for “Personal Team Volume” and is sales volume generated by personally recruited affiliates. GV stands for “Group Volume” and is sales volume generated by an affiliate’s entire downline (unilevel team). Retail commissions are paid out on the sale of Xerveo products to retail customers. Commissions are also paid out on preferred customer orders, at a rate of 10% per order placed (minimum two autoship orders must be active in order to qualify). An affiliate who meets the qualification requirements for preferred customers commissions, also receives $50 worth of Xerveo product credit each month. For each additional two retail autoship orders placed, an affiliate receives an additional $25 in credit. Residual commissions in Xerveo are paid out via a unilevel compensation structure. Xerveo cap payable unilevel levels at ten. Xerveo’s Generation Bonus uses the same unilevel team as residual commissions, with a generation defined in each unilevel leg when a Silver Leader or higher ranked affiliate is found. Once found, the first generation of that leg is capped off and the second begins. Distributor Enrollment Commissions are a recruitment commission paid out when a newly recruited affiliate places their first product order. The commission rate paid out is 20% of the net retail price of the order. The Leadership Bonus Pool is made up of 2% of Xerveo’s company-wide sales volume. Affiliate membership with Xerveo is $55. We didn’t have much to go on regarding Xerveo’s products in our initial review, with the Xerveo website today a vast improvement. Xerveo’s products are presented clearly and retail pricing is readily available on an online store platform. The products themselves still appear to be rooted in tamarind, however in a broader sense there’s nothing that really stands out. The addition of artisan soaps seems out of place in what is otherwise your typical weight loss and nutritional supplement MLM offering. The recruitment-driven matrix Xerveo initially utilized has been ditched for a retail-centric unilevel, which is again another vast improvement. Of particular note is a Xerveo’s monthly retail requirements, which increase corresponding to an affiliate’s rank. This encourages healthy retail sales even at the top tiers of the compensation plan. Retail autoship has also been nicely woven into the compensation plan, paying out 20% the first month and 10% thereafter. The product credit bonus was a nice touch and serves as an effective retail incentive. The weak area of the Xerveo opportunity, if I had to pick one, is the product offering. As I mentioned earlier, nothing really stands out. Still if the products work they’ve overall a pretty solid offering, which is marketed effectively are complimented by a retail-orientated compensation plan. You can’t ask for much more than that in an MLM business opportunity. 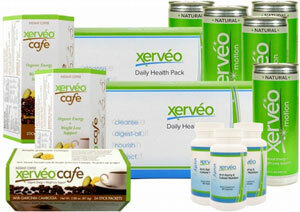 My suggestion if you’re contemplating Xerveo affiliate membership would be to try the products and go from there. It probably wouldn’t hurt to check out health stores in your area to suss out the competition too. If all of that checks out, you’re looking at a $55 buy in plus whatever products you purchase to get you started. Good luck!